Plot: A confederate army deserter builds his own militia in the swamps of Mississippi, comprised of runaway slaves, local farmers and fellow deserters who are being pillaged by their own ruling authority. 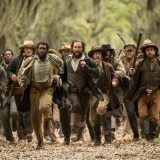 Free State of Jones provides a cinematic experience, throwing us back to Mississippi at a time when corruption and American morals were blurred. It’s 1864, in the depths of Mississippi and we’re plunged into the world of anguish, destruction and death that was caused by the American civil war. Free State of Jones is a vivid and detailed interpretation of Newton Knight’s ventures into rebelling against the confederate army. We join Newton (Matthew McConaughey) in his quest to create a better world for himself and his neighbours by opposing the ruling authority of the confederate army. Knowing the price of military abandonment, he seeks unity with runaway slaves and likeminded farmers, thrusting him into leadership as the group grows and grows. 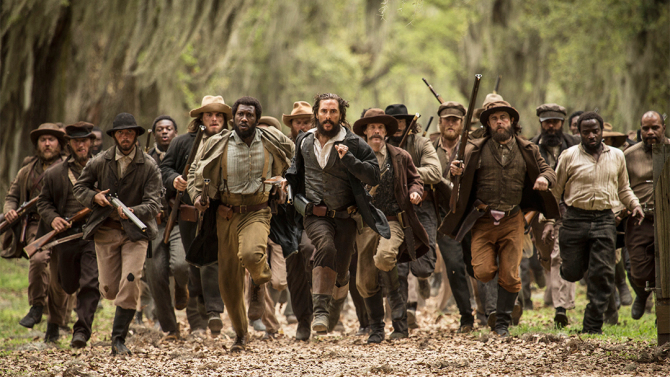 Free State of Jones follows factual dates and events and we progress through the years of the civil war as laws are being re-written, showing first-hand the effects they had on civilians. The film is something of a vanity project for McConaughey. Commanding our attention with a range of dreary-eyed, often vacant looks to the extreme of despair, this purposeful execution is usually employed to mask a toxic inner-conflict that he portrayed so perfectly in True Detective and Dallas Buyers Club. However, the role of Newton Knight doesn’t provide McConaughey any depth, we don’t know his motivations, and this leaves the film a tad flat. Historical biopics often rely on a good old dose of fiction to stir emotion, add a further cinematic experience or enhance the plot. Examples of this could be Jack and Rose’s romance in Titanic, finding Ryan in Saving Private Ryan – the list is endless. 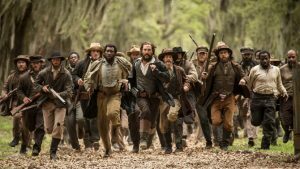 But Free State of Jones sometimes feels like watching the History channel, and it would be great to dig deeper into the real life events of Newton Knight to see the parallels from the book to screen. Sticking specifically to the topic of slavery in most recent cinema, it has to contend with the likes of Django Unchained and 12 Years A Slave, both are remembered for their powerful, gut-wrenchingly awful moments throughout. Unfortunately, this film can’t be held in the same regard because of the distinct lack of those precise moments. While an uninterested McConaughey is one issue, there are some great supporting performances by Gugu Mbatha-Raw and Mahershala Ali, who play Rachel (Newton’s love interest) and Moses (a strong-willed and determined runaway slave) respectively. It would certainly have enhanced the film if they were featured more. Despite its flaws, Free State of Jones still provides a cinematic experience, throwing us back to Mississippi at a time when corruption and American morals were blurred. The costume design and depth of the environment makes for rich visual viewing, and the film would have improved if it was actually slightly longer – already being a 2 hour plus movie – and capitalised on the potential of other characters.